and leave you relaxed and rejuvenated! Knitting 101 is about going beyond the knit and purl stitch. This series is designed to teach you new skills and help fill in any gaps that you might have in your knitting knowledge. In Knitting 101, each class focuses on learning a single technique so that you can begin to familiarize and master each new skill without feeling overwhelmed. To participate, you must register at least 5 days before the class. There is limited seating and some classes will require you to do prep work. If you have any questions or would like to register, please contact us at 267-396-6938 or https://www.echovalleyfiber.com/script.html. Payment is required at the time of registratIon. Did you know that you do not always have to rip out an entire project for a dropped stitch? In this class, you will learn how to save a dropped stitch from several rows below and get it back on the needle. We will do this in the most common knitted fabric designs, stockinette and garter. 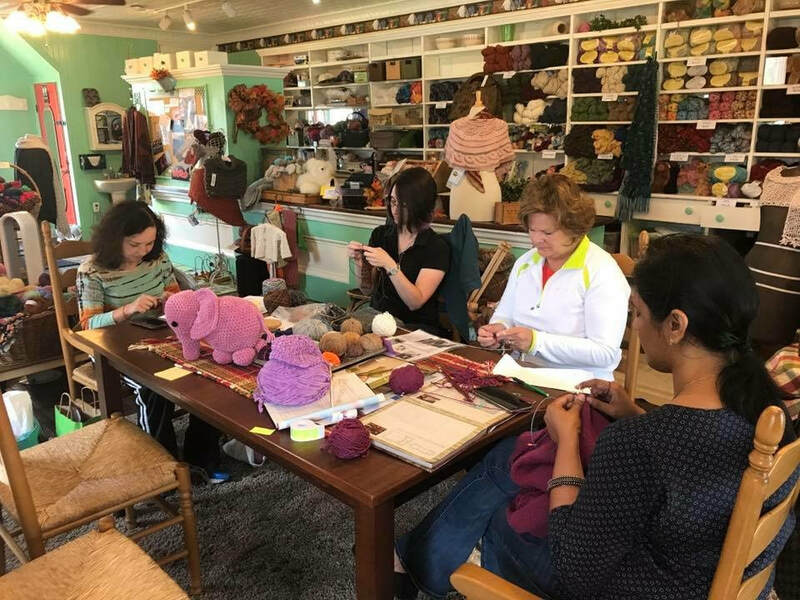 The technique learned in this class will help you start to overcome your fear of making mistakes while making you more comfortable with reading your knitting and your stitches. To register for this class, you must know how to knit and purl. You will receive an email after you register detailing what materials and prep work will be needed for this class. Have you ever had that feeling of frustration and hopelessness when you find a mistake and realize that your knitting can’t be salvaged, and you have to start over? In this class, we will talk about another option, ripping-back. Instead of starting over again, you have the option to save some of your hard work and will learn how to rip out your knitting to right before the mistakeand safely return those stitches back onto the needle. In this class, you will also learn how to “pick-out” your knitting, stitch-by-stitch, to fix mistakes that have just happened. To register for this class, you must know how to knit and purl. It is also recommended that you are familiar with picking up dropped stitches. After you register, you will receive an email detailing what materials and prep work will be needed for this class. Decreases are essential to knitting. They provide shaping for sweaters, hats, mittens, shawls, stuffed animals, socks, and so on. In this class, you will learn about two most common types of decreases, the K2tog and SSK, and how they are used in knitting. You will start to learn how to read and count your decreases along with becoming familiar with the motions of creating them. To register for this class, you must know how to knit and purl. You will receive an email after you registerdetailing what materials will be needed for this class. There is no prep work for this class. Increases are essential to knitting, in that they are the counterpart to decreasing. If you ever had an interest in knitting a sweater top-down, or trying your hand in lace knitting, knowing your increases is a necessity! In this class, we are going to cover two of the easiest increases, the yarnover (yo) and knit-front-back (kfb), aka. the bar increase. When paired with decreases, you will be able to start tackling basic lace and more complicated patterns. To register for this class, you must know how to knit and purl. You will receive an email after you register detailing what materials will be needed for this class. There is no prep work for this class. Upcoming classes – details coming soon!